Hi there! 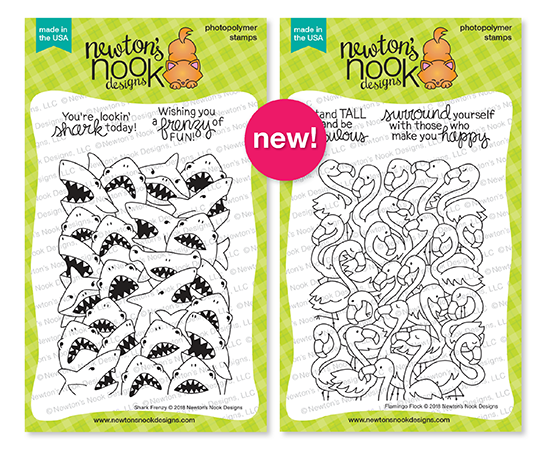 We continue the Newton's Nook Design release with two new sets. * Hallo daar! Ook vandaag gaan we verder et de Newton's Nook Design release, deze keer met twee nieuwe sets. 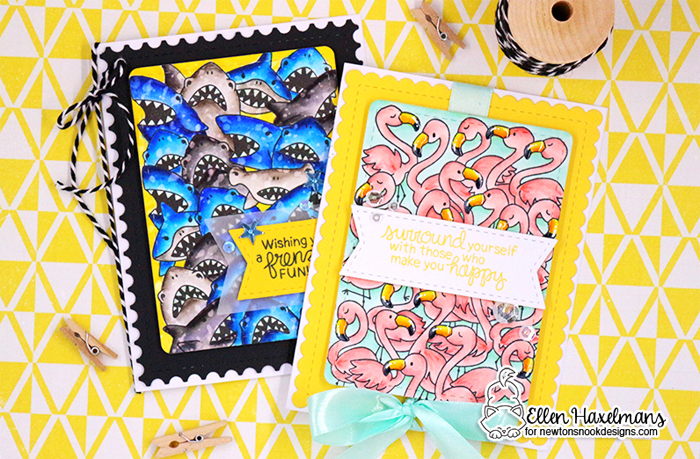 We have the "Shark Frenzy" and the "Flamigo Flock" stamp sets. These two will fit perfect in our crowd stamp series. 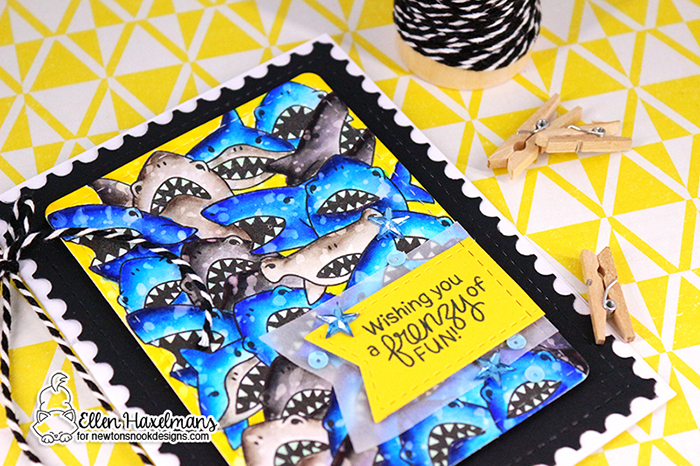 * We hebben de "Shark Frenzy" en de "Flamigo Flock" stempel sets. Deze twee wille dan ook perfect passen in de 'groep' serie stempels. In this blogpost you will see a girls and a boys card. The flamingo stamp set is in my opinion more for girls. 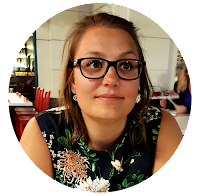 * In deze blogpost zien jullie een meisjes en een jongenskaartje. De fmamingo kaart is naar mijn mening meer voor de meisjes onder ons. I started coloring with Copic Markers and finished the card of with glossy accents, colored paper and ribbon. * Ik begon deze kaart met het kleuren van de afbeelding met Copic Markers, daarna werkte ik ze af met Glossy Accents, gekleurd papier en een lint. The boys card is of course the one with the sharks. These are colored with my Zig Markers and afterwards I sprinkled water on top. I really like the texture the water gives to the sharks. * De jongens kaart is natuurlijk diegene met de haaien op. Deze kaart kleurde ik in met Zig Markers en nadien sprenkelde ik er water op. Ik hou echt van de textuur die jet water op de haaien geeft. These pretty images make it really easy to create a card. After coloring all the hard work is done. * Nadat je de mooie afbeeldingen inkleurd is het erg gemakkelijk om de kaart af te werken. Na het kleuren is her harde werk gewoon gebeurd. Beautiful colorful cards. Love them. The sharks really look fierce. how fun are those background stamps! and love the blue sharks! Love the bright yellow in both of your cards! 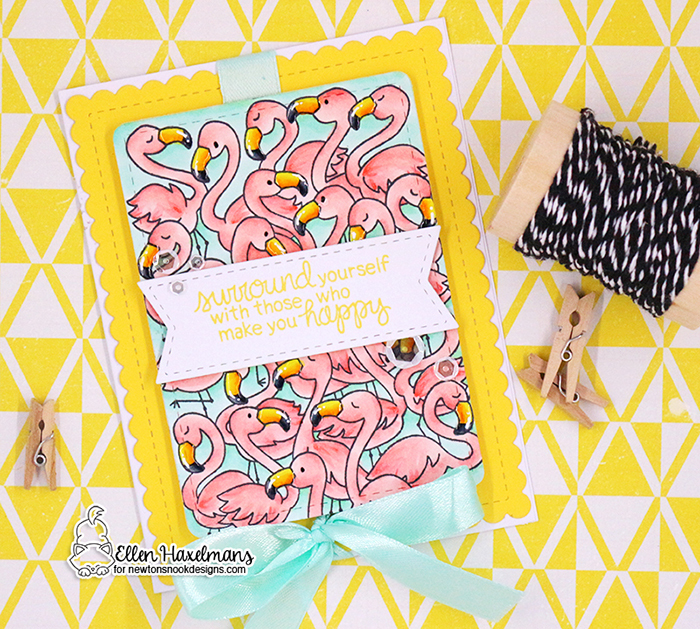 I especially love your flamingo card which is so bright and cheerful! Very fun cards...love the cool sentiments that work so well with these images. Fun and colorful. I like the sentiments. Love these two big stamps. So fun and will be fun to color! I love the pop of yellow in each of these! Really makes them stand out! OH MY BEAUTIFUL CARDS! I really like the Postage Stamp style border that you have around the two card images very cool! And using the color yellow to the Flamingo card is ABSOLUTELY GORGEOUS to look at!!! Really love how you colored the sharks! These cards are so bright & colorful! They make me smile! So beautiful! Bright and happy cards! Beautiful coloring and the images just pop against the sunny yellow color. Love your card designs with these cool stamps! Thanks for sharing. Your cards are beautiful ! I love your choice of a yellow background on a black cardstock, it makes a fantastic contrast. Gorgeous cards, beautiful colouring! I'm really enjoying this release! Happy 5 years to Newton's Nook! I love the crowd serie so much and these two last sets just as the others. My favourite card today is the flamingo one but you’re right, the water gave a great look to your sharks. Wonderful cards! 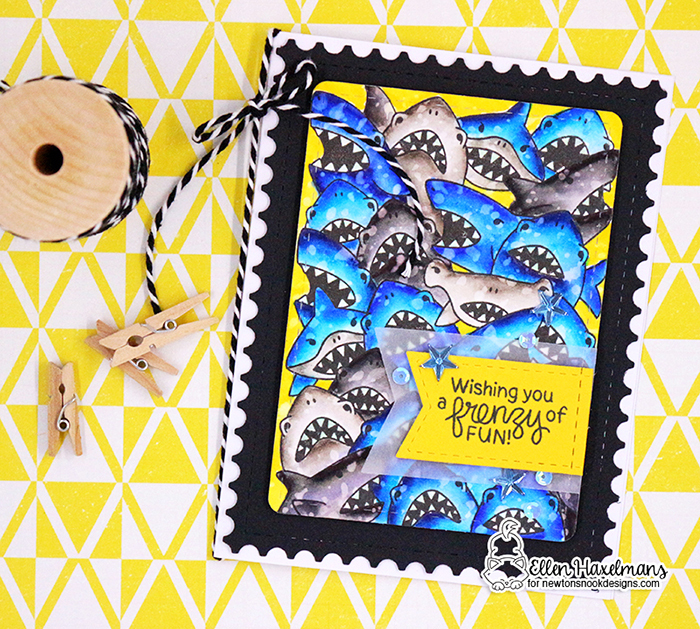 I love the yellow backgrounds, especially for the sharks!